High-climbing, twining vine with smooth, glossy, paired, semi-evergreen leaves and 2-4 flowered clusters of red, tubular blooms followed by bright-red berries. Leaves ovate to oblong with smooth, rolled down margins and a blunt or short pointed tip those immediately below the flowers fused at the base. This vine has showy, trumpet-shaped flowers, red outside, yellow inside, in several whorled clusters at the ends of the stems. Papery, exfoliating bark is orange-brown in color. Fruit a red berry. 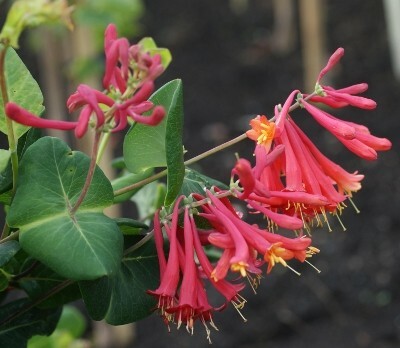 Coral honeysuckle was introduced in 1656 by Mr. John Tradescant junior, an English gardener who visited Virginia in 1654. Even as his father John Tradescant senior, both were successively gardeners to King Charles.